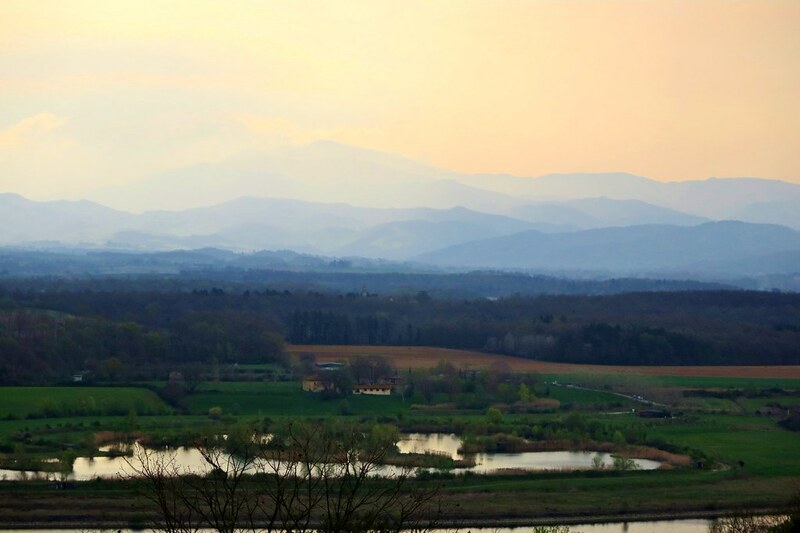 North of Florence are the Appenine Mountains. 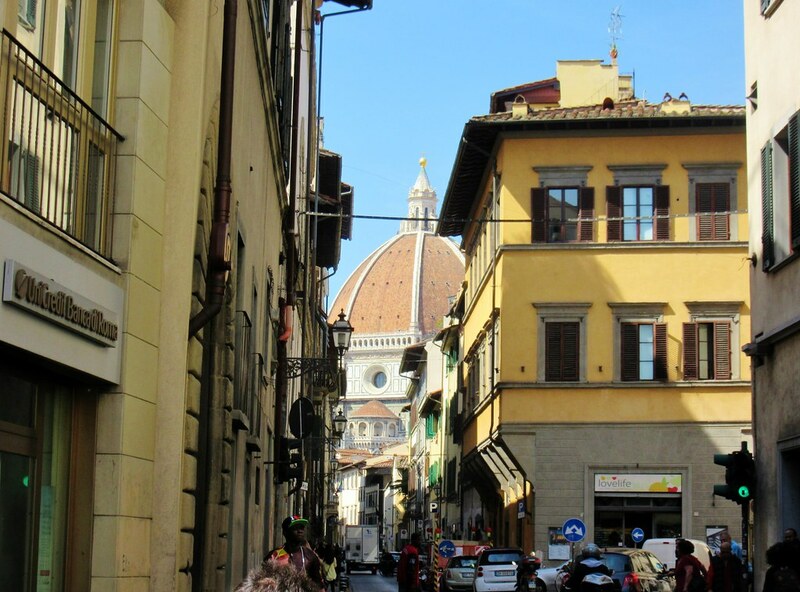 On our first day, we only had a short ride through the foothills, via Fiesole to Borgo San Lorenzo. It was quick and easy getting out of the city, Sunday traffic is always light. 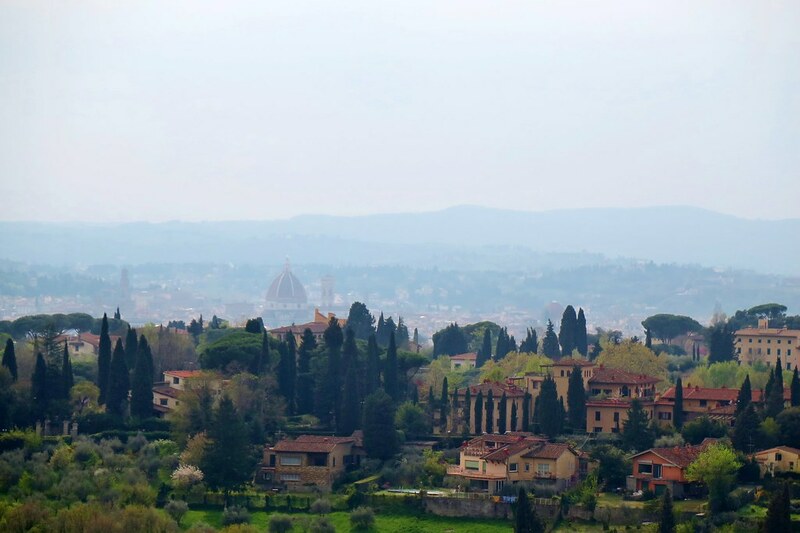 Then we zig-zagged up, gaining height quickly with views back to the Duomo in the haze. The weather was changing, we had a few drops of rain and some rumbling thunder from the clouds closing in over the valley. Luckily, we reached the pass after 20 kilometres then accelerated downhill, leaving the storm behind us. 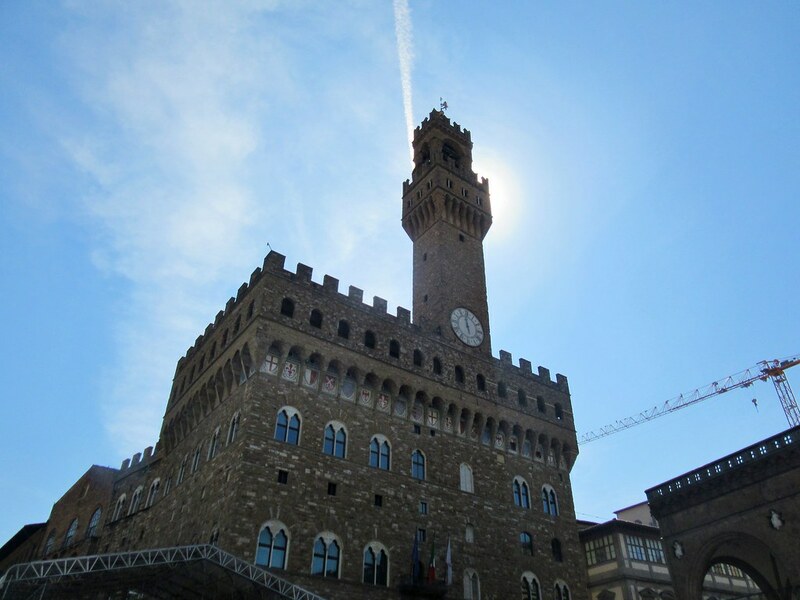 In Borgo San Lorenzo we found our way to Piazza Garibaldi to meet Enrico, a Warmshowers host. 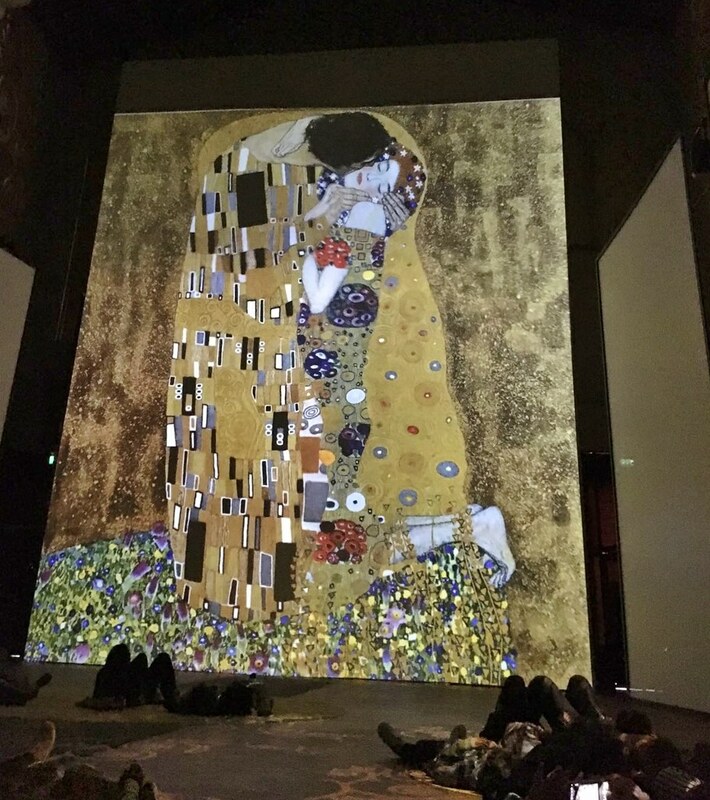 He came out with his wife, Dalia, and their three children. He bought us an ice cream then showed us back to his home, where we were welcomed as family and treated to a delicious dinner. The next day, Enrico and Dalia took us to a cafe for coffee and breakfast then said goodbye to go off to work. 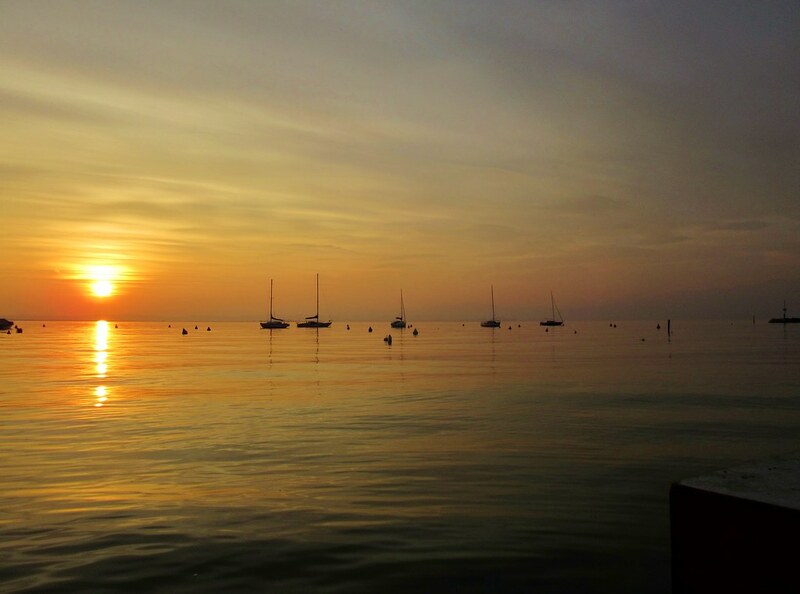 We cycled away with new friends and warm memories, yet another fantastic experience with Warmshowers. Enrico had briefed us fully on the road ahead. We were crossing the Appenines at the Passo della Futo, nothing too serious at just over 900 metres, but the first couple of hours were spent climbing. On our way up, we could hear a roar of engines from the nearby Mugello circuit that Ferrari uses for testing its Formula 1 cars. It sounded pretty cool to us, but apparently the local residents complain a lot about the constant noise. 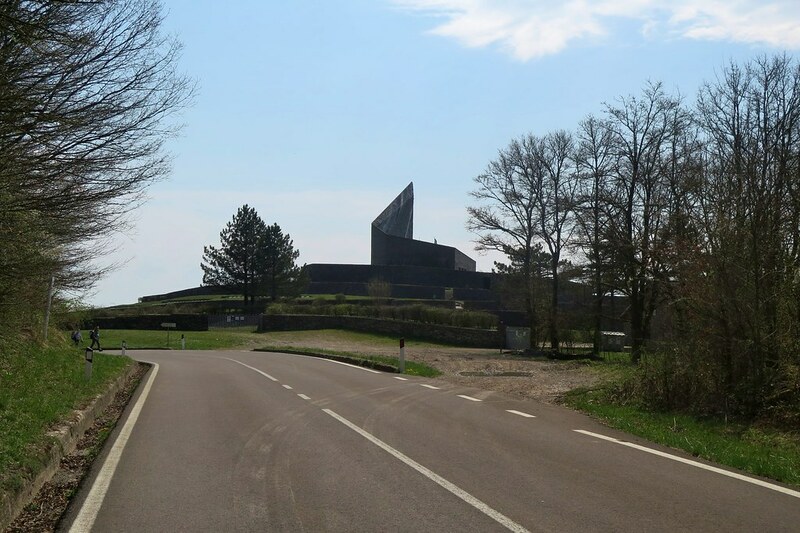 By lunchtime, we’d reached the pass, where there is a German war cemetery and a large monument. We stopped for some food and then continued towards Bologna. Up high in one of the hill towns, we saw a bike with panniers behind us, gaining ground very quickly. We stopped to wait and met Craig from the UK. 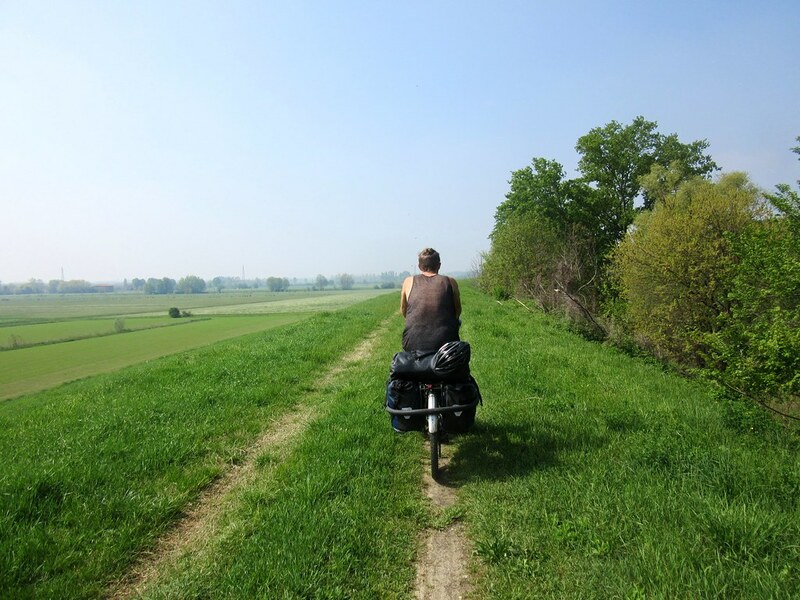 He had cycled from England, covering 2,500 kilometres in 3 weeks and was planning on reaching the ‘stans by June. Impressive speed. We haven’t met many British tourers, and coincedentally he’d also been working out in Niseko (a ski resort in Hokkaido) for the winter just past. We wished him well and watched him disappear ahead in to the distance. 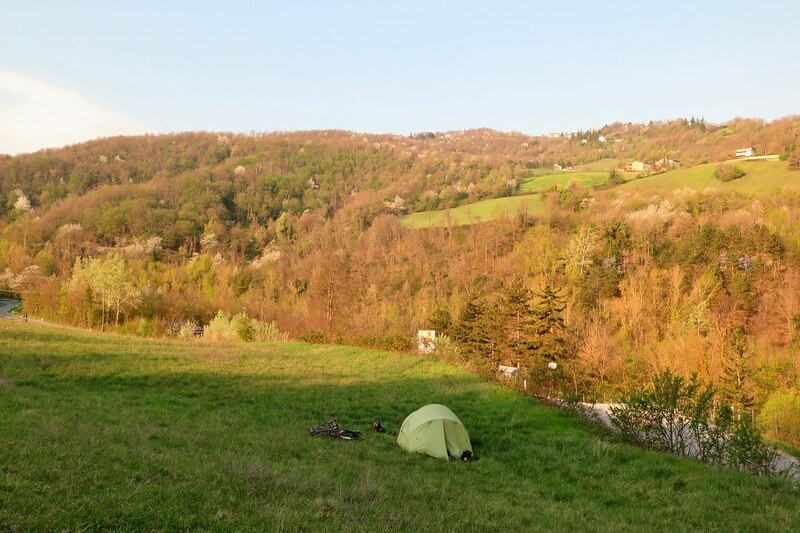 We started a long gradual downhill through the afternoon, then decided to pitch the tent in the hills before we reached the valley and the outskirts of Bologna. The next morning we left the hills behind and followed the valley floor joined by the autostrada and trainlines. 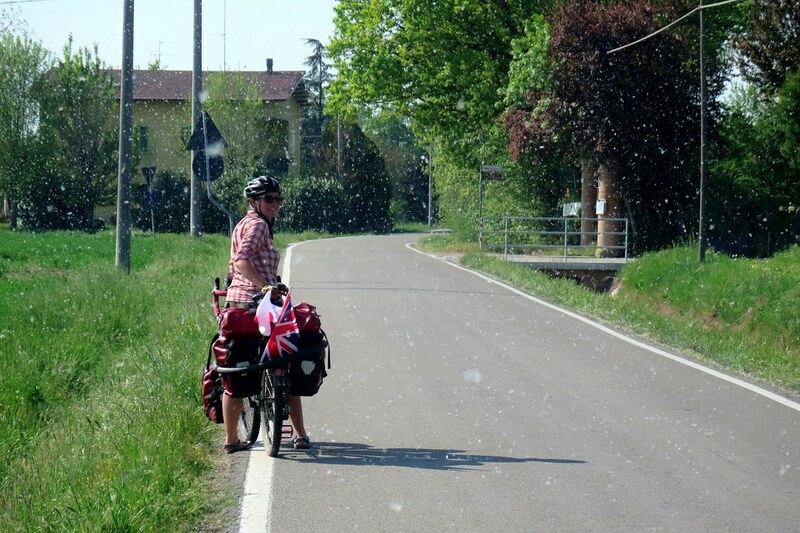 The traffic got heavier and we just got our heads down, cycling through the suburbs to skirt around the city and hook a left towards Modena. But we couldn’t pass Bologna without trying its most famous export. 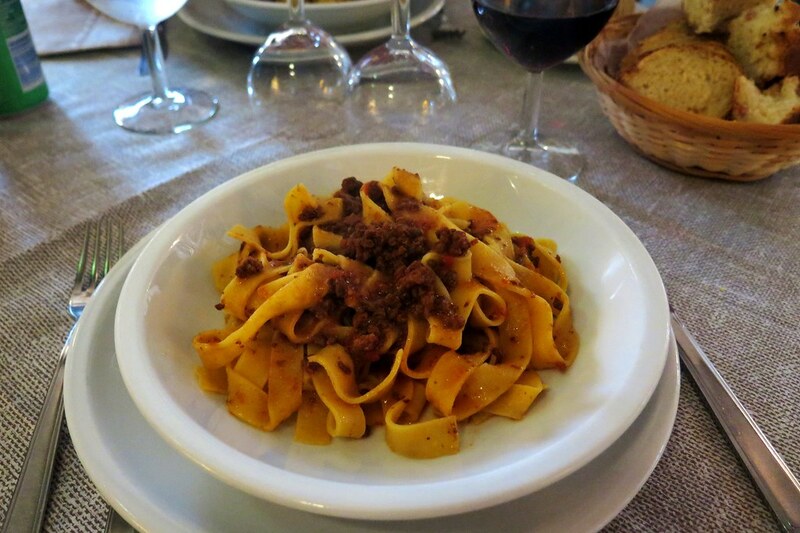 We stopped for lunch at an osteria for a tagliatelle alla ragu, aka the best spag bol we’ve ever had. The foodie day continued a little bit further down the Via Emilia. 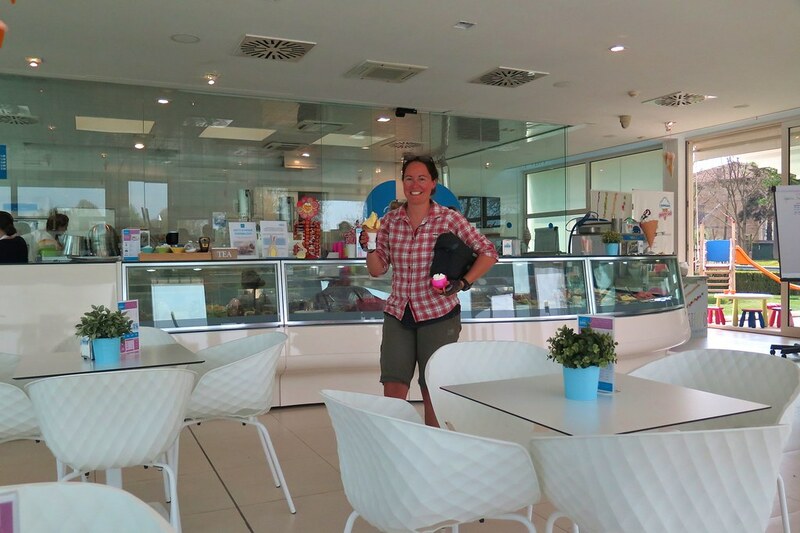 We passed a big ice cream factory near Castelfranco which had a very inviting gelateria outside. It was a warm, sunny afternoon and we couldn’t resist sampling some of the produce. 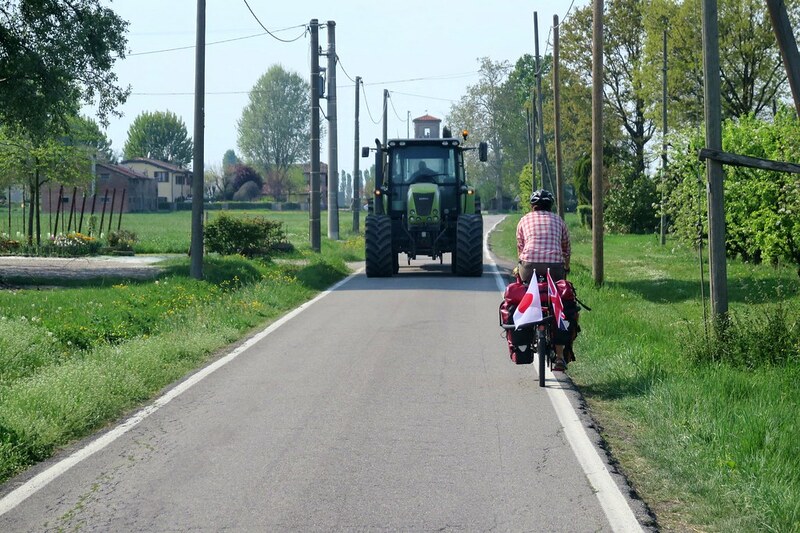 We turned off into the countryside north of Modena to work our way via the narrow farm roads to meet our next Warmshowers host. On the way, the blossom from the poplar trees was floating in the air looking like powder snow falling. 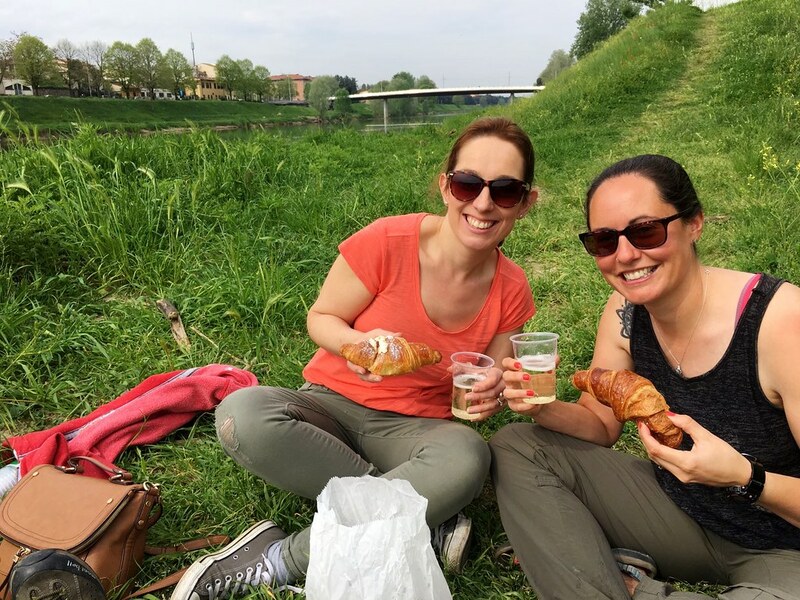 We sat in the sun next to a river for a while, killing time as we weren’t due to arrive at Luigi’s place until 6. 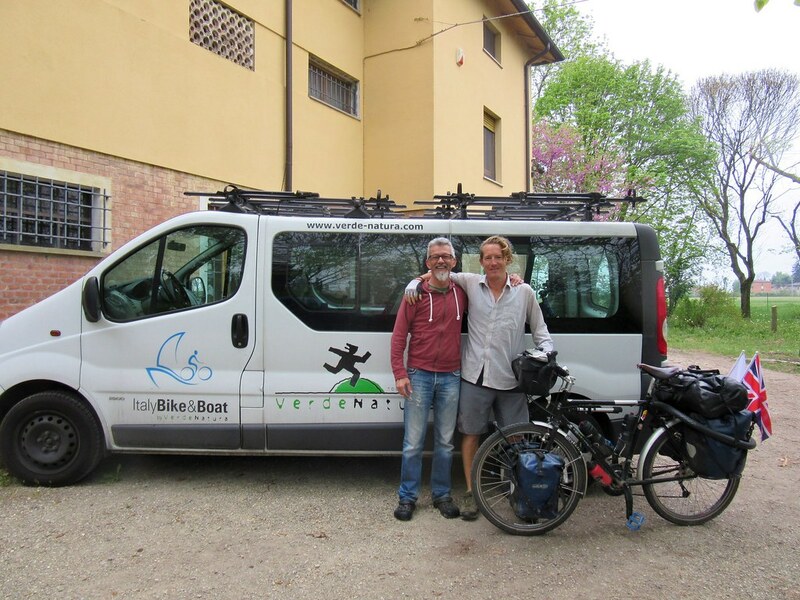 It was easy to find his house, outisde were a couple of vans bearing the logo of his cycling holiday company Verde Natura. 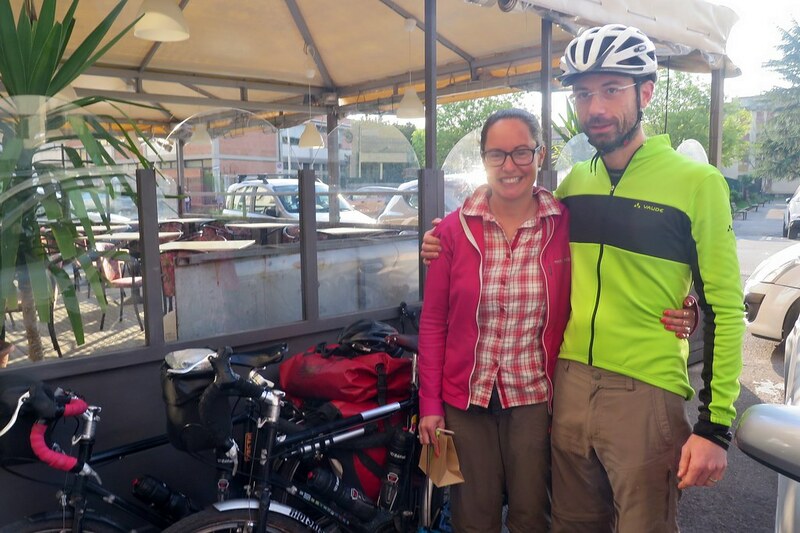 He led us around to put our bikes in a huge storage shed along with loads of other bikes, panniers and general cycling gear that he rents out to his clients. We had some really interesting conversation over dinner as we share a number of hobbies, not just cycling but also skiing, hiking and the outdoors in general. It was fascinating to hear about how he started his tour company and he gave us plenty of inspiration for the future. 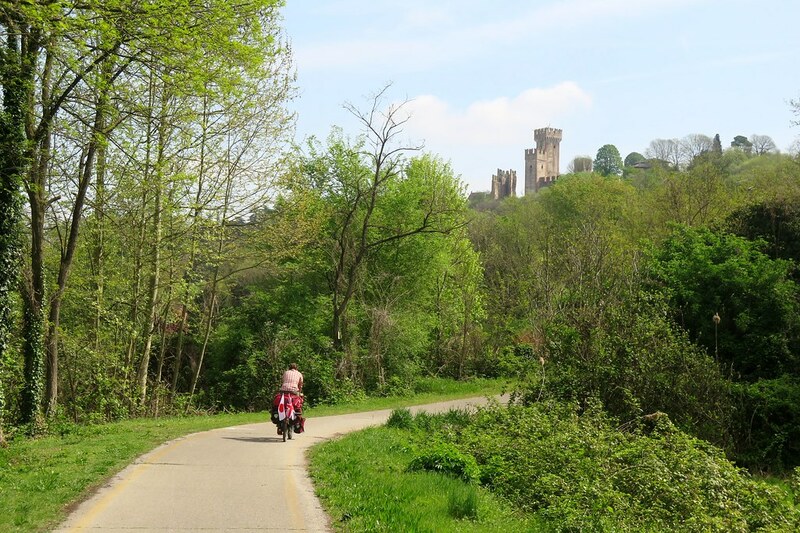 In our last blog post, we mentioned how we tried to follow the Eurovelo 7 cycle route but ended up on closed roads and steep, muddy paths. 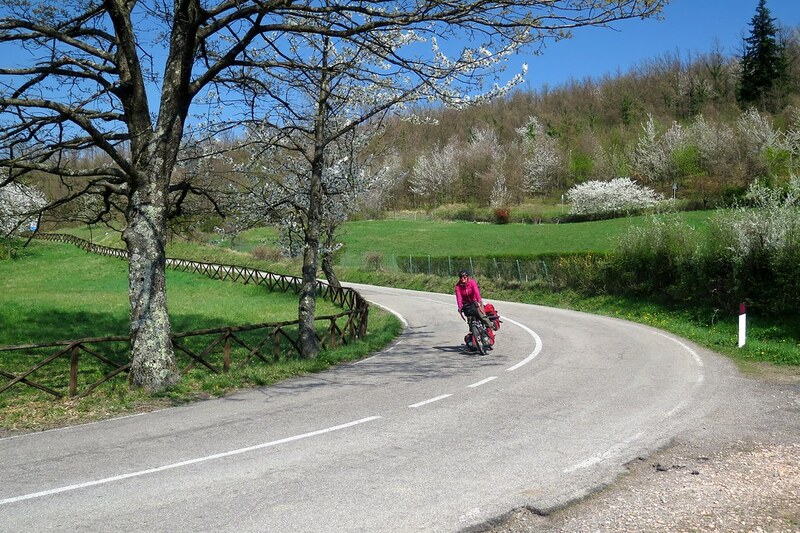 But, Luigi assured us that the routes in this northern part of Italy were actually a well maintained and connected network, plus it’s flat here until you hit the Alps. He’s a tour guide, he’d probably know, so we decided to follow his directions to join the route at the river Secchia, which we’d sat next to the previous day. For the next couple of days, we were almost completely off the road, riding along paths on riverside levees. The paths meandered with the rivers and were mostly gravel, so we made slow progress in a straight line, but we weren’t in a hurry (are we ever in a hurry!?) so it was all good. 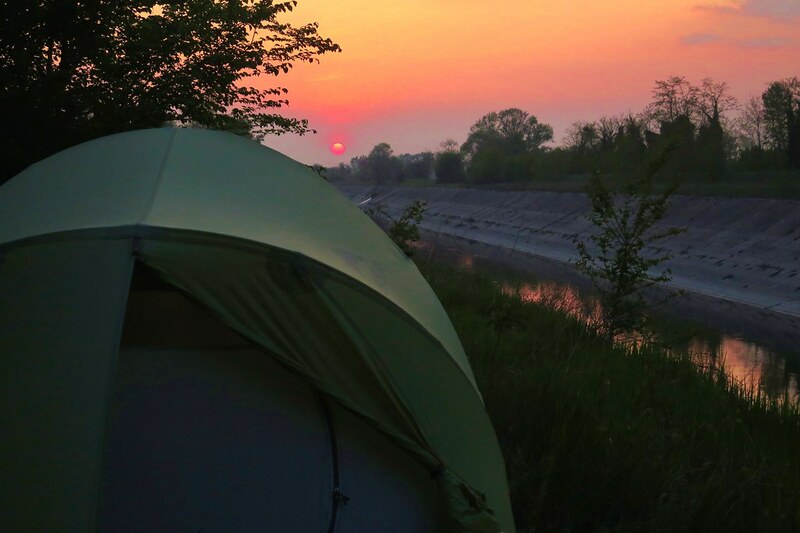 Plus, it was very easy to find camp spots behind the levees, hidden from any roads or houses. We had a bit of light rain and a couple of very dewy mornings but by the time we crossed the River Po near Mantova the sun was shining and the blue sky had returned. 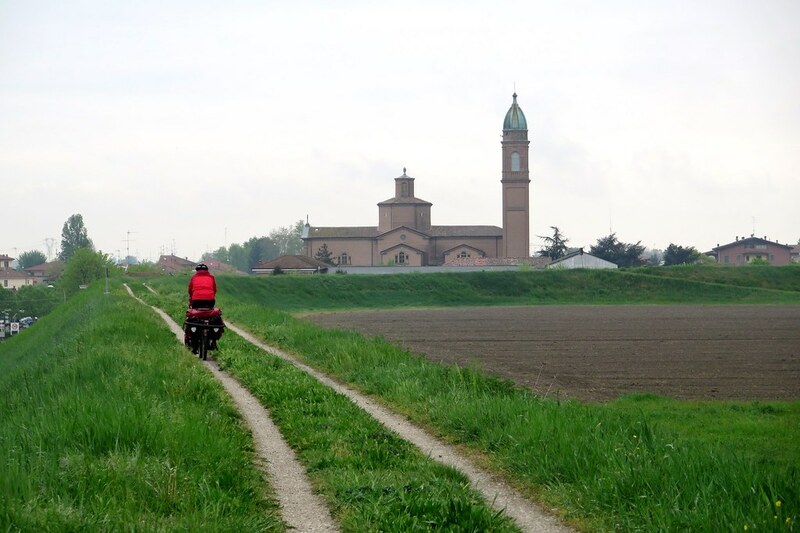 The path from Mantova to Peschiera is the route that we’d heard most about. 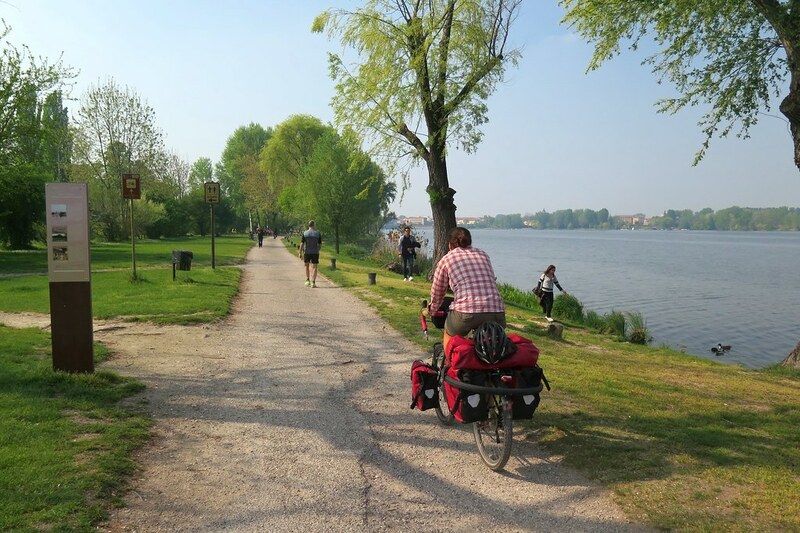 45 kilometres of sealed cycle path following the river Mincio north to where it flows out of Lake Garda, very popular with local cyclists and tourists alike. Mantova itself was a nice town although, like in Florence, many of the roads were closed for construction so it took us a little while to find our way to the riverside. Once we did, it was well worth it and we joined other cyclists, joggers and walkers out enjoying the afternoon sunshine. We decided to only go a little way out of town before stopping for the day. Again, finding a campspot was easy, just through some trees from the path next to a canal. 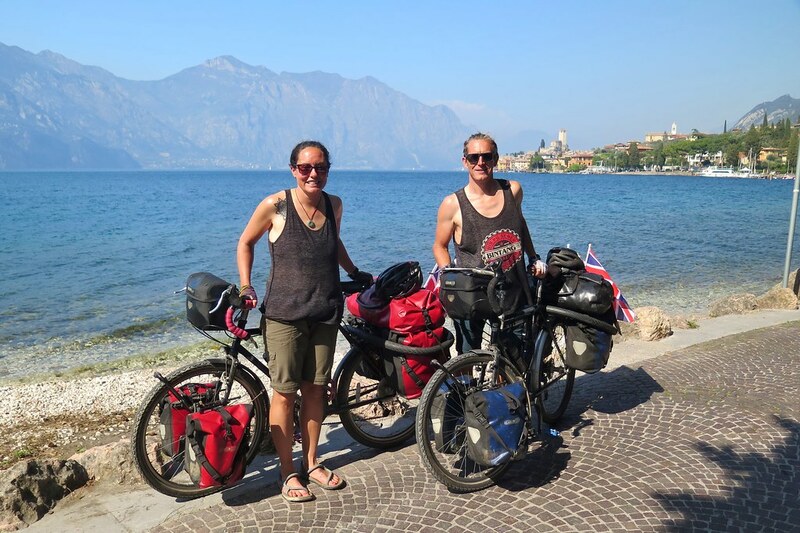 It doesn’t seem like many would camp along the route – the locals are just out for the day, and the tourists are on supported tours, cycling between pre-booked hotels with their luggage transferred in advance for them. Nothing wrong with that, I reckon it’d be a nice way to spend a week’s holiday, but we sometimes feel a bit of a divide between us and some cyclists. Like we’re slightly looked down on, with our cumbersome bikes and baggy, dirty clothes, or when we’re killing time sitting around with our stuff drying in the sun. Or maybe that’s just reverse snobbery on our part? 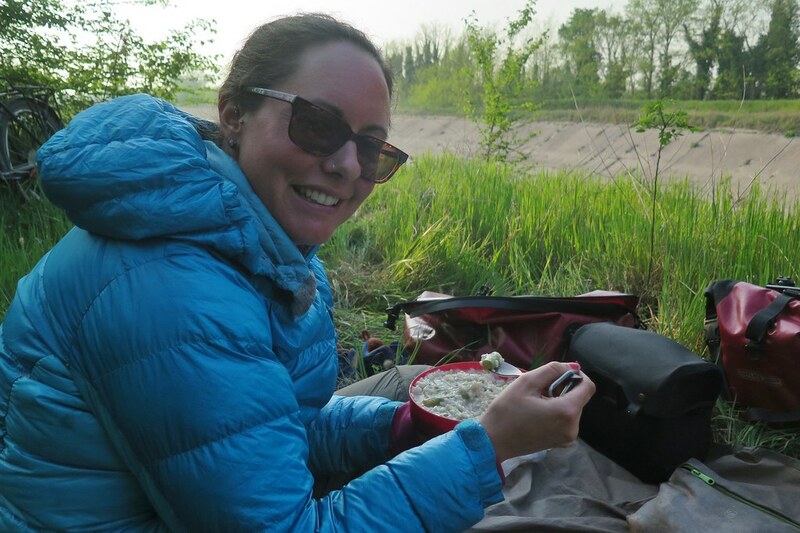 Anyway, we enjoyed our wild camp that evening, sitting watching the sunset eating an asparagus risotto washed down with local white wine, like gourmet hobos. 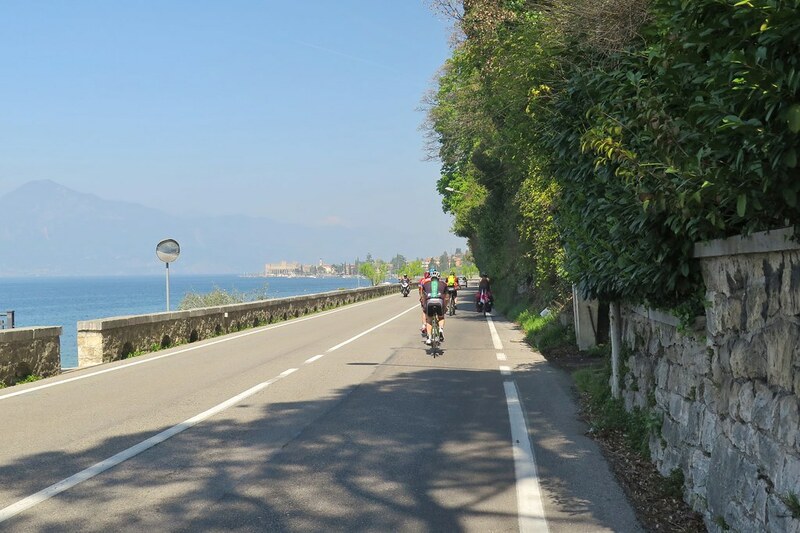 The cycle path to Garda was as good as everyone said it is – flat, smooth and scenic. We made the distance quickly even though we were riding slow and chatting. 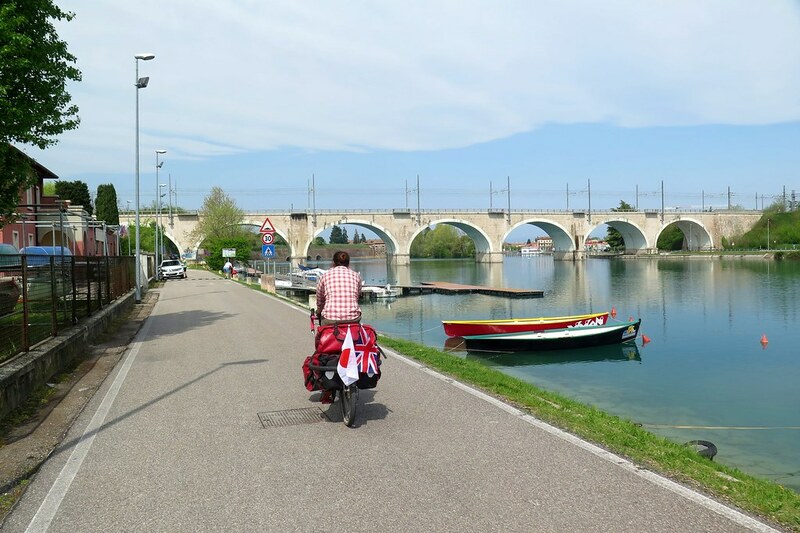 Just before we got to Peschiera, we cycled under the autostrada which marked a small, but kind of significant point for us. 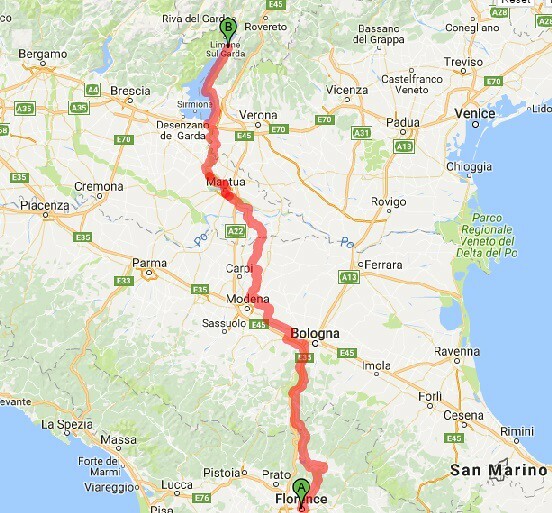 We’ve driven down to Lake Garda before from the UK, and when we crossed the autostrada, our respective routes by car and by bike met. So at that point, in a way, we can say we’ve covered the distance from Japan to the UK overland. We’ll carry on and do the whole lot by bike though! We followed the path all the way in to Peschiera to the lakeside and had some lunch. From there we joined the road again, to ride up the eastern lakeside. This is a very touristy area, with hotels, themeparks and campsites everywhere, so no real possibility of wild camping without being very, very cheeky. We opted to camp officially, and pay out for a patch of grass to pitch our tent. It was a nice patch of grass, with water, electricity and even wifi. Definitely a different style of camping – most of the other folks there were in campervans or caravans set up for long stays. But it was good to be able to leave our bikes and gear in a secure place and go for a walk next to the lake. Sitting on a jetty watching the sunset, I got my phone out my pocket to take a photo of the beautiful view. In doing so, I pulled the key card for the campsite gate out, which dropped in to the water and sank to the bottom. I had been saying to Clare that I fancied a swim, but the water felt pretty chilly. 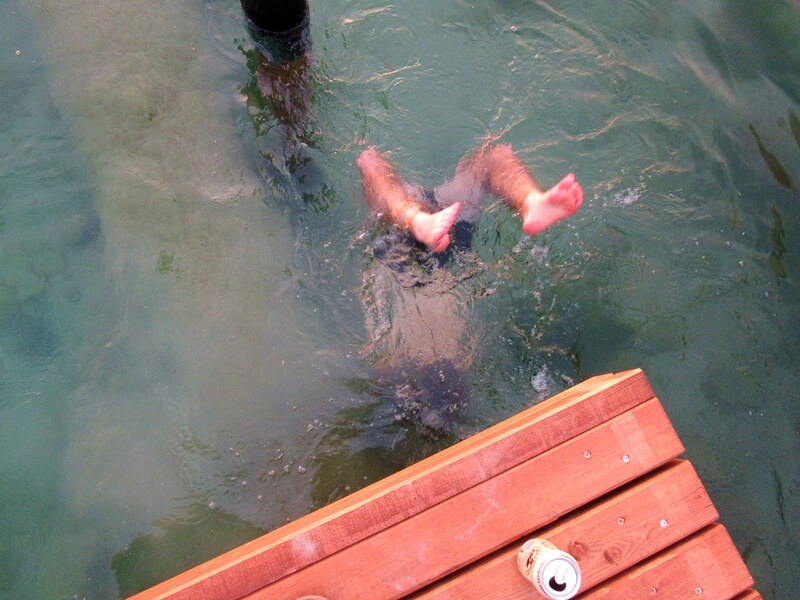 Now I had no choice but to man up for a quick, unplanned, evening dip. Very refreshing. 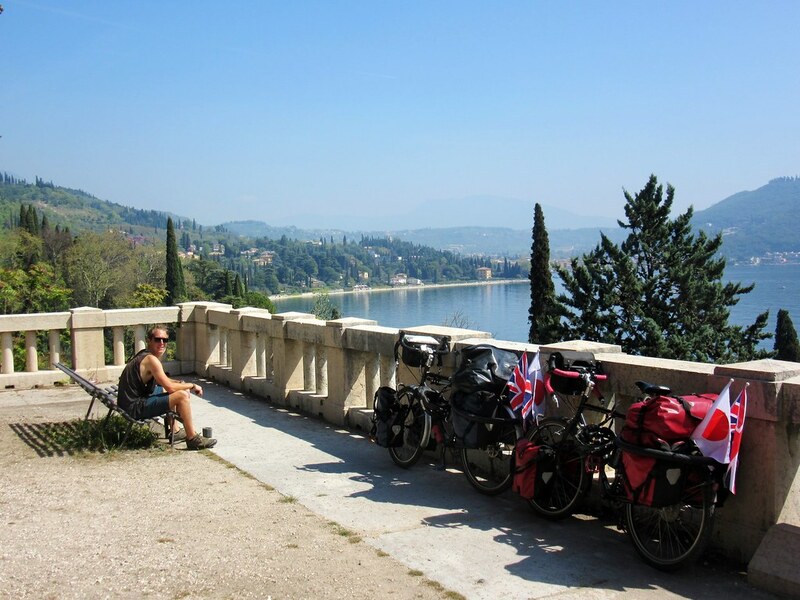 We were looking forward to the next day’s ride, up the lakeside to Malcesine. The weather couldn’t have been better for us, warm and sunny, as we headed north up to the more mountainous section where the lake meets the first peaks of the Alps. The perfect combination of our favourite types of scenery, water and mountains, which is why we chose to get married in Malcesine back in 2008. We were in high spirits, cycling slowly with plenty of photo stops. At first we followed a rough cycle path next to the lake then joined the road which, as it was Saturday, was busy with other cyclists, mostly the lycra clad variety. We stopped for lunch at a picture perfect little picnic area, slightly raised above the water, where we lingered for a while sunning ourselves and enjoying the view. 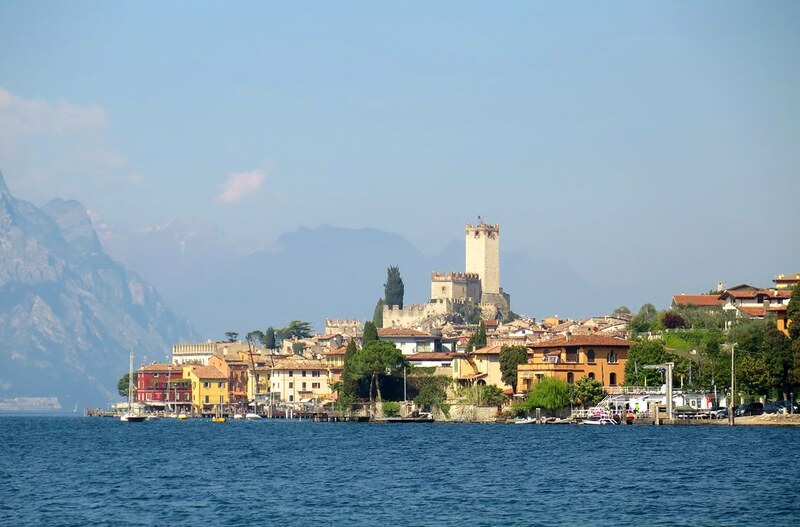 We rejoined the lakeside just south of Malcesine, happy memories flooding back to us as the town and castle came in to view. It’s the first time we’ve been back in nearly nine years, and it’s just as beautiful as we remember. We’re looking forward to spending a few days here, relaxing and planning the next stage across the north of Italy towards France.